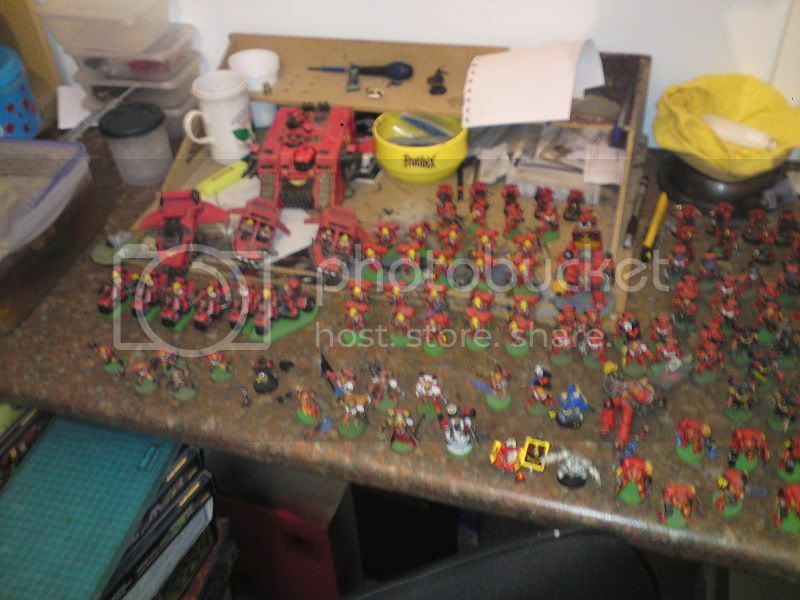 Portal » Board index ‹ Blogs ‹ Cain Tiberius's Blog ‹ BA Blog 1st November Old models updated. Howdy folks. After dragging myself away from Space Marine.... I was able to finish updating 4 of my squads from my 10+ year old BA force. I present to you 3 tactical squads and 1 devestator squad. What have I done you ask.. I have removed as many mould lines that I missed 10 years ago that I coulld, without causing to much extra work now. I have removed baldy heads and replaced them with either new BA helms or BA heads. 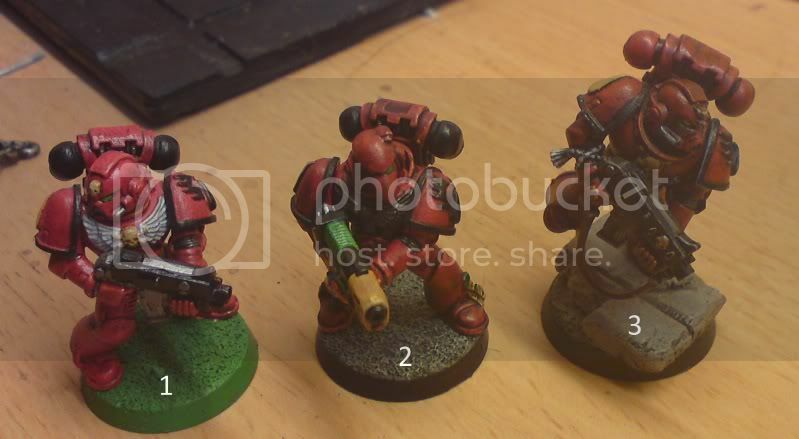 I have added Sculted back pack flags to the Sergeants and painted squad markings on all the models. Other than that, I have given all models a generous wash of Delvin Mud, and then bring the red back a lil with watered down Blood Red. And repainted some of the detailing. 2nd Squad led by Sergeant Arvo. 5th Squad led by Sergeant Pattrazi. 6th Squad led by Sergeant Icaral. 9th Squad led by Sergeant Alcoro. 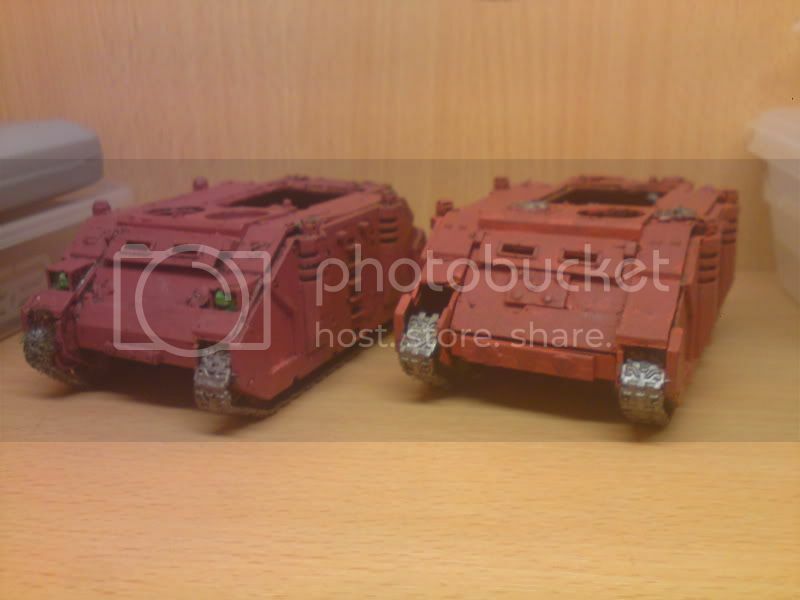 Next I am going to reclaim 2 ebay Rhinos that are in very poor condition, and 2 more Rhinos given to me by a friend that are in much better condition. These will be used for the 4 above squads. I also have 2 assault squads, a bike squad including attack bike, 2 terminator squads, a scout squad, an old captain with honour guard and 3 landspeeders from my old army that I haven't decided what to do with yet. C&C welcome and appreciated as always. Re: BA Blog 1st November Old models updated. They look really good. Do you have pics of what they looked like before? As usual. I didn't think to do proper 'before' pics until it was too late. However, I did post a pic after I did a test update. So you can see the change. Marine #1 is the old colour scheme. Marine #2 is the modefied colour scheme. Marine #3 is one in my new colour scheme. Also here are some group pics from before I started. They aren't great I'm afraid. There are still other squads that I haven't updated yet (2 assault squads, a bike squad, 2 terminator squads and more) So I'll try and take a couple pics of them this afternoon so you can get an idea of what the above looked like. I do like the third colour scheme best, dark and gritty. Those goblin green bases are a blast from the past! They just don't look right now, something best kept in the past with GW's red era! Yeah, I know what ya mean. 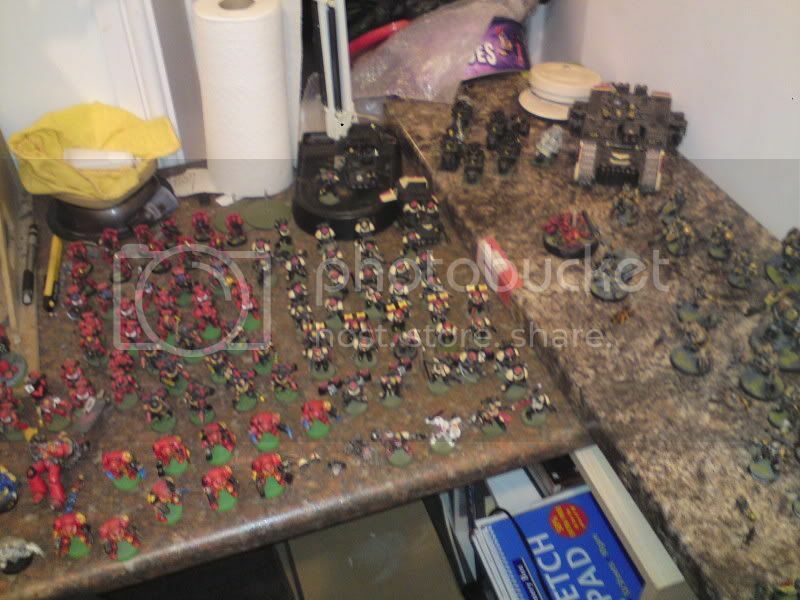 When I got my old figures back, I also got a couple boxes of old books (paintin guides, index astarties, chapter aproved ect) and white dwarf mags. Looking through them, and seeing completed GW examples with no highlighting what so ever, and very very little shading. Can barely believe they even made it to print, lol.